The Duke is Alive in Bagni di Lucca! 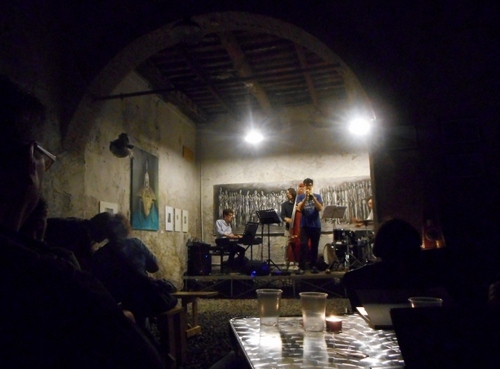 Bagni di Lucca’s Spring Jazz concert organised by Marcello Cherubini and the Montaigne Foundation is, now in its fifth year, a much-looked-forwards-to event. I admit to great ignorance in matters of jazz but have always enjoyed it when played by such a group of artists as we heard last Sunday. The line-up was Piero Frassi piano (one of the finest jazz pianists I’ve heard in Italia , Nino Pellegrini double bass and Vladimiro Carboni, percussion with singer, Greta Mirall It was, indeed, Greta’s quartet and they supported her brilliantly. She has an admirably subtle voice, impeccable English accent and it surely tells that Greta is one of the great Michela Lombardi’s students. Jazz is truly thriving and swinging in Italy. I wish it were more so in the UK where my listening highlight was hearing Bill Evans live at Ronnie Scott’s. Bagni’s Chiesa inglese was packed and we were glad we’d pre-booked. The event was free with a contribution of five euros for the restoration of the English cemetery. What with the extraordinary playing and singing of the evening I almost felt the dead there would have been raised and dancing and swinging to the Duke’s immortal melodies. 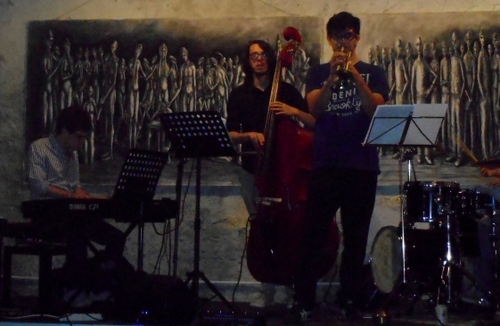 This jazz spring concert at Bagni di Lucca is surely here to stay as a permanent fixture so if you’ve missed it this year watch out for it in the next! This October Lucca Jazz Donna returns. It’s a festival dedicated to female jazz talents organized by the Circolo Lucca Jazz with the City of Lucca, Capannori, Lucca province, the sponsorship of Tuscany Region, Fondazione Cassa di Risparmio di Lucca, the Fondazione Banca del Monte di Lucca and the patronage of Tuscany’s Equal Opportunities centre. The festival’s twelfth year programme, under the artistic direction of Circolo Lucca Jazz, includes six free concerts, including five with two sets of performers and a final conversation and concert with jazz leader Dee Dee Bridgewater. There’s also a new collaboration with three Italian record companies: Filibusta Records, Philology Records and Alfa Music Records. On Saturday, October 1 at 9.15 pm at Palazzo Ducale (Cortile Carrara, Lucca), there’s the opening of the festival’s 12th year entitled “Heartfelt music on Filibusta Records from Something There & Isk” with two sets made with Filibusta Records. In the first set, there’s ‘Trioness’ with Federica Michisanti on bass, Sebastiano Ragusa on tenor sax and Simone Maggio on piano. In the second set there’s the Milena Angelè quintet with Milena Angelè, tenor sax , Edoardo Ravaglia, piano, Enrico Bracco, guitar, Riccardo Gola on bass and Fabio Sasso, drums. The “La Luna” association, which works against violence on women, will be present. Additional information points: Equal Opportunities Centre of Lucca Province, Cortile degli Svizzeri, 2 (0583.417.489, centro.po@provincia.lucca.it) and the City of Lucca, public relations Office, via Del Moro, 17 (0583.44 .24.44, urp@comune.lucca.it). On Friday, October 7 at 9.15 pm in Artè room (via Carlo Piaggia, Capannori), there’s an evening presented by Philology Records. The first set is with the Cettina Donato trio: Cettina Donato, , Nino Pellegrini, bass, Vladimiro Carboni, drums, guest Michela Lombardi, vocals. Second set with Michela Lombardi & Pietro Frassi trio who present “Solitary Moon – The Music of Johnny Mandel”: Michela Lombardi, vocals , Piero Frassi piano, Gabriele Evangelista on bass, Andrea Melani on drums. Free admission. 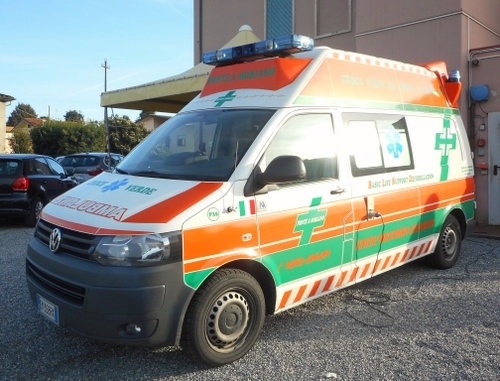 The ‘Emergency association’ that works in bringing free medical care and quality to the victims of war and poverty will be present. On Saturday, October 8 at 9.15 pm at the Artè room (via Carlo Piaggia, Capannori), an evening presented by Philology Records. First set with the Daniela Troilo trio who present the album “Wait and See”: Daniela Troilo, vocals, Piero Frassi, piano, Massimo Moriconi, bass / electric bass, Lucrezio De Seta, drums. Second set with Emilia Zamuner trio: Emilia Zamuner, vocals, Lewis Saccocci on piano, Massimo Moriconi on bass, Massimo Manzi on drums. Friday, October 14 at 9.15 pm at the Teatro San Girolamo (via San Girolamo, Lucca), an evening presented by the Alfa Music Records. First set with the Daniela Spalletta & Donatello D’Attoma duo, who present the “Shema” album: Daniela Spalletta on vocals and Donatello D’Attoma on piano? Second set with the Federica Colangelo Quartet presenting the “Chiaroscuro”: album Federica Colangelo at the piano, the Simone Alessandrini on saxophone, Mihail Ivanov on bass, Riccardo Gambatesa on drums. Free admission. The Anffas Onlus association that works in helping the families of people with disabilities will be present. On Saturday, October 15 at 9.15 pm at the Teatro San Girolamo (via San Girolamo, Lucca), an evening presented by Alfa Music Records. First set with the Gaia Mighty U-Man Trio featuring the “Infant Speech” album: Gaia Possenti piano, Luca Pirozzi on bass, Massimo Carrano on drums. Second set with the Patty Lomuscio quartet presenting the album “Further to Fly”: Patty Lomuscio on vocals, Mirko Signorile, piano, Giorgio Vendola on bass, Pierluigi Villani on drums. Free admission. The UNICEF Onlus association which protects and promotes the rights of children and adolescents will attend. On Sunday, November 6 at 9.15 pm in the Church of San Francesco (Piazza San Francesco, Lucca) there’s an evening with Dee Dee on the subject of Lucca women’s jazz world. Conversation with Dee Dee Bridgewater and Simona Burattini, TG2 Rai journalist. 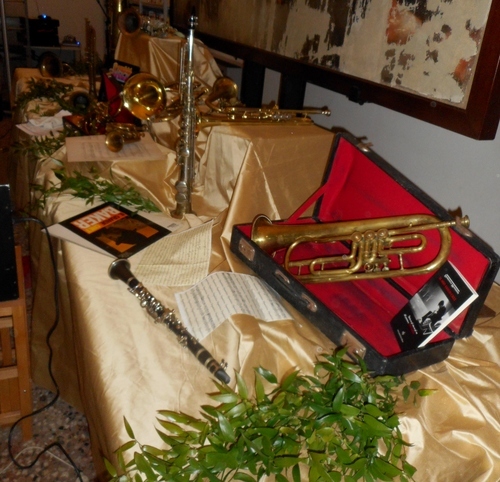 Presentation of the “Pino Massara” first prize ” to four young jazz and modern music performers, by MAP, Authors Federation, UNESCO Club of Lucca and Lucca Jazz Club. A concert follows with Dee Dee Bridgewater on vocals, Theo Croker on trumpet, Anthony Ware on saxophone, Michael King on piano, Eric Wheeler on bass, Kassa Overall on drums. Free admission. Funds for Italy’s earthquake victims will be collected. There was quite a lot going on at Ponte a Moriano last week-end. 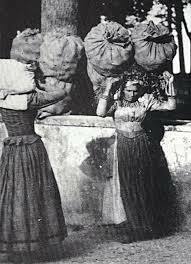 First, it was the festival of the town’s patron saint, Sant ‘Ansano, whose statue graces the bridge after which the town is named. (For more on the bridge, which celebrates its 900th anniversary this year and the town itself see my post at https://longoio2.wordpress.com/2015/10/16/ponte-a-moriano/). Second, there was an attractive Christmas market which included my first sighting of Babbo Natale this year. Third, there was a small but very select display of vintage cars calculated to delight anyone who remembers motoring as it once was. Spot the Lancia Fulvia here? The festival was accompanied by a scrumptious lunch which included the best-filled neccio (chestnut pancake) I’ve had for ages (ricotta cheese and Nutella). It was a wonderfully relaxing way to spend a sunny Sunday afternoon. An exhibition on the Mille Miglia car race which, this year went through Ponte a Moriano (and also Ponte a Serraglio). The photographs were quite stunning and some were on sale. I think a book should be made of them. 2. An exhibition by the children from the local primary school – most inventive. Recognize the Klimt? 3. 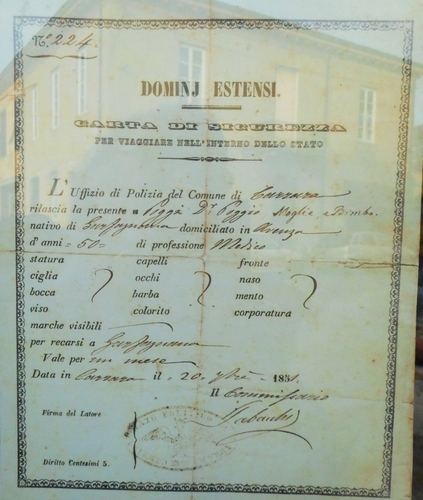 An exhibition of war memorabilia (if war could ever be described as memorable) from the Gothic Line committee. (See my post at https://longoio.wordpress.com/2014/05/26/secret-mission-across-the-gothic-line-a-success/ to find out about the gothic line). WHO DIDN’T FLY FROM THE TRUTH. 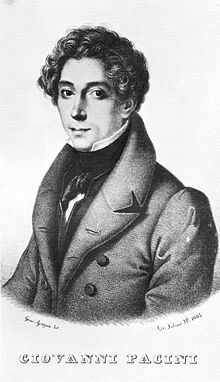 Who was this Nieri who had Ponte a Moriano’s theatre named after him? 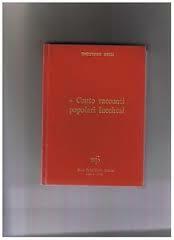 and his works on Lucchese folklore. Nieri also translated Theophrastus’ ‘Characters’ from the Greek. Live and learn… I can now put a face and a biography on that previously unknown name! So it’ all over for another year. Our Bagni di Lucca’s Arts festival’s third year ended in a gentle, almost melancholic way, after a day filled with unpredictable rain storms, at the cantina by the river with a party and a jazz concert given by the FM (Francesco Massagli) jazz quartet consisting of Francesco Massagli, piano, Tommaso Iacoviello, trumpet and flugelhorn, Francesco Sarrini, double bass and Duccio Bonciani, drums. 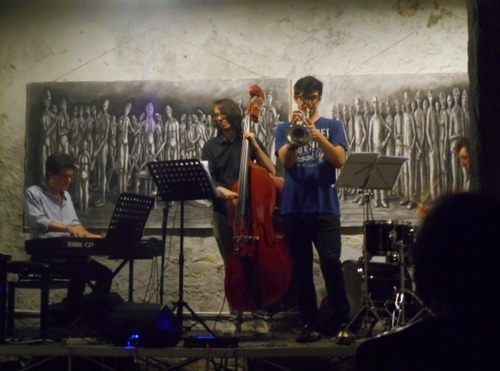 The Francesco Massagli Quartet started up in 2014 at la Fondazione Siena Jazz where Francesco studied. Last May they issued their first album. 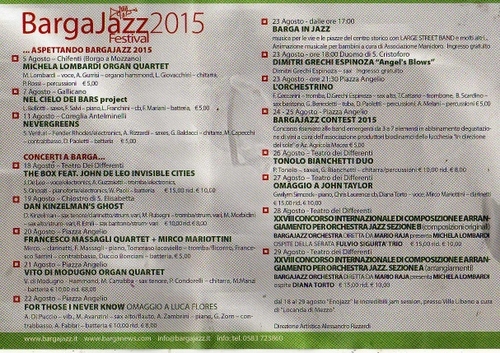 ‘Journey of hope’ and were finalists in Barga’s 2014 jazz festival. FM’s web site at https://soundcloud.com/francesco-massagli4et will give you some flavour of their unique style. To describe it as the journey of a river from source to mouth could not be more appropriate. It’s fluid, divides, joins and rises to great waterfalls of sound – an appropriate music to one recurring theme in the festival which was water in all its permutations and associations: water as a graveyard in Darlington’s ever more poignant and evolving tableau of what the Mediterranean has become for so many fleeing the horror of events in so much of the world; water in the haunting fish of Pieroni which were now inhabiting the wall and ceiling of La cantina almost converted into a giant aquarium; water in the amazing conference; water, depicted in poems in the camera oscura space, new for this year; water with Mr Kepler himself in the river Lima. The fluidity of the painters, Mirta Vignatti, Andrea Perelli, David Finkbeiner, Zhu Ye, Filippelli, and Magoni, the textures of sculptors Lorenzo Vignoni and Anna Cordiviola, the video film and installation by Paolo Fiorellini, Glauco Disacco and Sergio Talenti the photograph of Peter Dematté all seemed to merge, for all their differences, into the great theme of our planet, its resources and that precious water, liquid light, which so welcomingly came yesterday to refresh not only the landscape around us but our minds too. There is always a feeling of nostalgia when an event on this scale which, like the element of water so much of it celebrated, brings life to Ponte a Serraglio, is over. I can’t stand it when books have to end, cannot abide those goodbyes at railway stations, those adieus at airport check-ins, those closing parties until I realise that every ending means a new beginning, every goodbye a different hello and every door closed on this year’s wonderful arts festival, so adeptly organised by Jaqueline and Jake, opened into innovative portals onto a new year in which art in all its highest and most humane qualities will disseminate hope in the future, faith within our lives and love towards our planet. Last night celebrated a truly a big thank-you for all those who contributed in every possible way towards a festival which is ever going to re-create itself. I was so glad to be a part of it all. In this trilogy of creation all I know is that within the speck of time that circumscribes our lives we have touched our bodies and minds, reaching out one for another across two parallel tracks in the cosmic space, coming from unknown regions, going to unwritten countries. This anniversary is the anniversary of our decision to look at the same scenery for awhile, listen to the same music, feel each other’s breathing, share a life in two, live through fire and water, love one other. Will there be other meetings beyond this breath, other journeys, other meetings, other worlds? Who will take us then for themselves? First, the setting: the triumphal arch flanking one side of Nottolini’ masterpiece, il Ponte delle Catene at Chifenti, dating from 1840 and Italy’s first iron-chained suspension bridge. Second, the spectacular ever-changing lighting before the neo-classical arch. 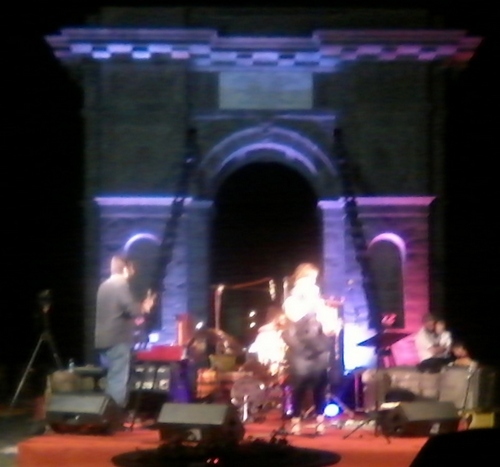 Third, and most important, a jazz quartet of superlative quality: the Michela Lombardi Organ quartet. The Hammond organ player virtuoso, Alberto Gurrisi, drew from this highly temperamental instrument all the fluidity, staccati and expressive tones it is capable of. Every break from Gurrisi was amply and deservedly well-applauded. Luca Giovacchini on guitar made his instrument sound in parts as if it were rhythm, bass and lead all wrapped up in one. The miraculous use of controlled feedback shows that Giovacchini is well on the way to becoming one of the finest jazz guitarists on a European scale. Pacho Rossi, percussionist, wearing a suitably red siren suit showed his amazing range of sound production from standard drum kit, through bongo to chimes. A band needs someone to tie it together and the utterly magical voice of Michela Lombardi brought everything into an astonishing unity. Her songs were sung with perfect English diction: every word felt and every expression communicated. Her scatting was outstanding and, particularly in the softer numbers, her ability to sustain a sotto-voce was quite seductive. Born in Viareggio in 1973 Michela did her first live performance at just the age of fourteen. She graduated in philosophy at Pisa University and studied theatre technique. Her vocal training was in Milan conservatoire and her jazz singing teacher was Tiziana Ghiglioni at Bologna. Michela’s first CD Gently Hard was issued in in 1999. From then on it’s been a great success story with such hits as By your side and Reach out. Michela is also a teacher and among her pupils there’s even been Andrea Bocelli. The main theme of the evening was the blues and the programme started off with a driving example of Chicago urban blues. There was a particularly poignant song where blue skies were transmuted by disappointed love into the blue devils which haunt the blues. There were classic numbers like near to you, some great songs from some of her and the quartet’s album and a tribute to Joni Mitchell (happily now recovering) in Dreamland. All songs were sung in English, Michela’s main singing language, which she knows perfectly. We were all so lucky to be there! I cannot pretend to know too much about jazz but I know when I hear good music and last night, before the spectacular backdrop of the ponte delle catene, was brilliant and fully demonstrated the stratospheric excellence of Italian jazz at its best. And there’s more to come! 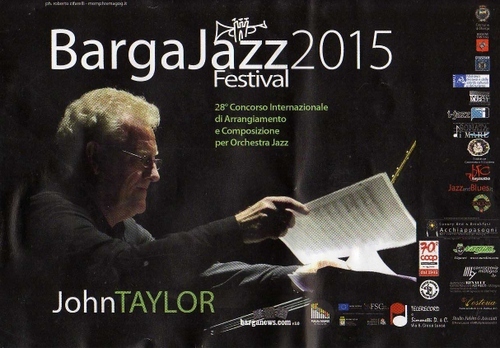 This concert was just a taster of that now mythical event, Barga Jazz, in whose programme, starting on the 18th of August, we are promised two more concerts by the outstanding Michela Lombardi and the Barga Jazz Orchestra. Unfortunately I only had a poor mobile phone to take pictures with but there’ll be plenty more to see at Barga news at http://www.barganews.com/ since fine photographer and editor Keane was also present at this memorable evening. 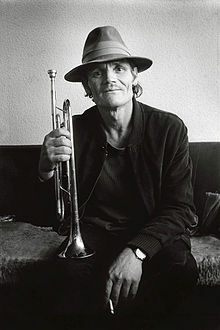 In August of 1960, Chet Baker, the great jazz trumpet and fluegelhorn player on the run from the US for drug problems, was stopped in the toilet of a petrol station on the road leading from Lucca to Viareggio. Chet was in the toilet for well over an hour and the attendant decided to call the police who broke down the door. They found a trail of blood, a syringe, vials of palfium (a powerful opioid analgesic approximately three times more potent than morphine and subject to drug prohibition regimes internationally through UN treaties) and an American who claimed to be “Chesney Henry Baker.” Following the investigation, the trial, conviction, and appeal at the end of 1961, Baker was sentenced to sixteen months in Lucca’s prison. Later during his imprisonment Chet was allowed to practice in the cell, for five minutes, twice a day, and the sound of his trumpet spreads through the city like the voice of a true jail bird stuck like a nightingale in a cage. People would gather on the walls which surround Lucca’s prison on one side to hear the incredible sounds coming from a barred window. This sound was superbly captured by the B. B. 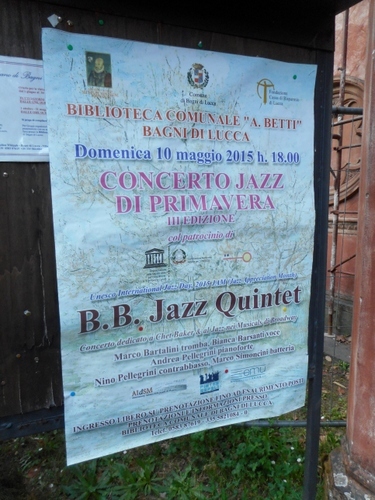 Jazz Quintet in their concert dedicated to the immortal Chet and to jazz interpretations of Broadway musicals at Bagni di Lucca’s Anglican church yesterday. 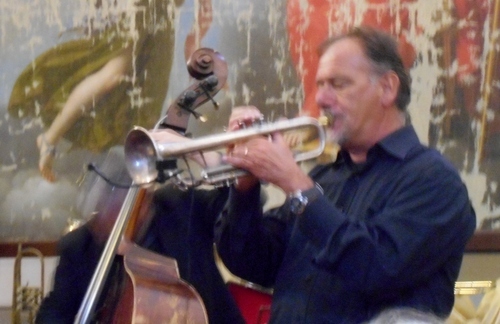 Marco Bartalini was “Chet”; a member of the audience who remembered those heady, tragic days when Chet was detained at Lucca’s Town council’s pleasure commented on Bartalini’s amazing re-evocation of the trumpeter’s smoky, sparse and melancholic sound. Andrea Pellegrini has to be one of the most superb Italian jazz pianists I’ve heard. Already scoring a great hit at Siena Jazz and venues throughout the world he showed complete mastery of the idiom required to accompany Chet numbers, especially those composed in Italy like “So Che Ti Perderò” (“I Know I Will Lose You”), “Il Mio Domani” (“My Tomorrow”), “Motivo Su Raggio Di Luna” (“Tune on a Moon Beam”), “The Route”. Pellegrino’s solos were superb, truly studied improvisations in the manner of the highest jazz expressions. 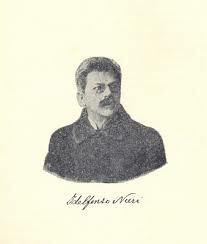 Nino Pellegrini, a noted teacher of double bass, showed his immense dexterity on the instrument, sometimes using a bow and moving the bass line with baroque ingenuity. Drummer Marco Simoncini combined a subtle approach to his art with understated emotional undertones using both padded and unpadded stick and fully exploiting the expressive capacity of his instrument. It was a just a pity that he was allotted only one break during the evening. Singer Bianca Barsanti showed herself at home both in musical and classical numbers. Her rendering of “Summertime” was especially convincing with a second verse in which she discarded mike and launched into a stratospheric soprano line worthy of the finest classical singers. 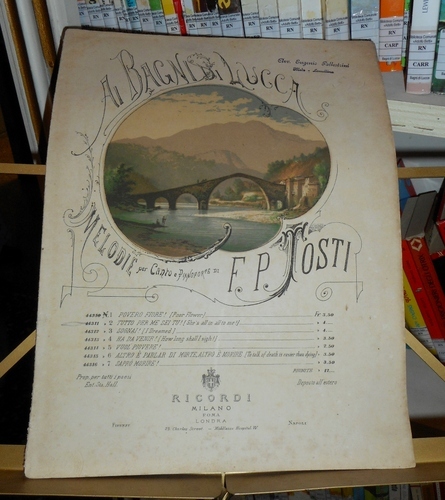 An added surprise was that half way through the concert Bianca exquisitely sang a fin-de-siècle song by Paolo Tosti, Queen Victoria’s own singing teacher , dedicated to the beauties of Bagni di Lucca and re-discovered by local historian Bruno Micheletti. A group is only as good as its ensemble playing. Pellegrini’s band was absolutely together, fully understanding through that universal language of music what each member was expressing. It was a delight to follow the intricacies of variation in the numbers and, especially with the Cole Porter songs in the second half of the (interval-less) concert, the audience was completely bewitched by the musicians. What is the history of Italian Jazz? Surely it must have suffered under fascism? Surely not! 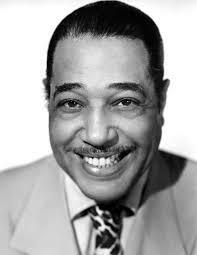 Unlike the Hitlerian regime Italy had no particular condemnation of “decadent negroid” music. Indeed, Mussolini’s own son Romano Mussolini developed into one of the country’s greatest musicians in this genre. And what is the significance of Chet Baker, described by jazz historian David Gelly as “James Dean, Bix and Sinatra rolled into one” and whose life, pock-marked by violence and heroin, was not exactly conducive to developing into a great musician. (But then why does jazz always have to have so much support from the darker side of humanity – is that side so necessary to the development of this barely hundred year old musical genre?) Chet was able to crystallise and see into the essence of jazz avoiding the too-many-notedness of Bebop and aiming towards an inner beauty, a coolness (by which is meant the use of fewer notes to express more things) which opened the door to the consummation of style that Miles Davis brought to unsurpassed fruition. At the end of the concert flowers were presented to the singer by Bagni di Lucca’s library supremo Angela Amadei on behalf of the Montaigne foundation who so generously organised the concert under its’ chair Marcello Cherubini, and we all felt that we had contributed at least one petal of those flowers that paid such a magnificent tribute to the great Chet and gave so much enjoyment. Truly, when I next pass Lucca Jail on my walk on the walls I shall cast my eyes upon the sombre building with a different look and perhaps, half-hallucinating (though not on palfium I hasten to add! 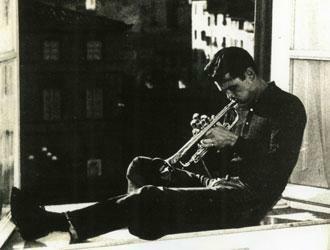 ), hear the inimitable sound of Chet’s flugelhorn.